Borobudur is one of the most popular tourist attractions in Indonesia. It is located at , in the province of Central Java, 40 kilometers (25mi) north-west of Yogyakarta. It is a Buddhist stupa related to the Mahayana tradition, and is the largest Buddhist monument on earth. It was built between 750 and 850 CE by the Javanese rulers of the Sailendra dynasties. Viewed from above, Borobudur takes the form of a giant mandala, symbolically depicting the path of the bodhisattva from samsara to nirvana, through the story of Sudhana described in the Gandavyuha Sutra, a part of the Avatamsaka Sutra. Some scholars think that this massive monument is actually a gigantic textbook of Buddhism to help people to achieve enlightenment. To read this Buddhist textbook in stone requires a walk of more than two miles. The walls of the galleries are adorned with impressive reliefs illustrating the life of Buddha Shakyamuni and the principles of his teaching. 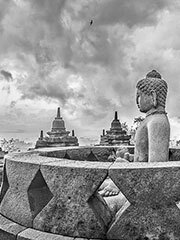 Representing the existence of the universe, Borobudur perfectly reflects the Buddhist cosmology, which divides the universe into three intermingled separate levels. The three levels are Kamadhatu (world of desire), Ruphadhatu (world of forms), and Arupadhatu (world of formlessness). The hidden base of Borobudur was originally the first level, which contains the gallery of Kamadhatu level. It is thought that during construction Borobudur experienced a landfall that threatened the entire building. To prevent the whole monument from collapsing, the Kamadhatu level was closed and made into a new base that holds Borobudur steady. This level of Kamadhatu pictures the world of passion and the inevitable laws of karma. The first 117 panels show various actions leading to one and the same result, while the other remaining 43 panels demonstrate the many results that follow one single effect. At least 160 relief panels were carved around this level, based on the manuscript of Karmavibhangga. What is left of these can be seen in the Southeast corner of this level. The relief of Rupadhatu level shows the stories based on the manuscripts of Lalitavistara, Jataka-Avadana and Gandavyuha. The Lalitavistara reliefs, consisting of 120 panels, tell us about the life of Siddhartha Gautama Buddha. It starts with a glorious descent of Buddha from the Tushita heaven. Born as Prince Siddhartha, Buddha’s childhood was isolated from the outside world’s misery. Accidentally witnessing the misery of sickness, decrepitude and death, young Prince Siddhartha decided to escape from the worldly life and commencing his search of freedom from suffering. Siddhartha’s long and painful search finally led him to the highest level of enlightenment and made him Buddha, the Enlightened One. This story ends with Buddha’s sermon in the Deer Park near Benares. The Jataka is a collection of stories about Buddha’s previous reincarnation, chains and virtues. According to the Jataka, Buddha has been born five hundred and four times before being born as Prince Siddhartha either in the forms of god, kings, princes, learned men, thieves, slaves, or a gambler. Many times he was born in the forms of animals such as lion, deer, monkey, swan, big turtle, quail, horse, bird and many others. But the Bodhisattva (title of a being on the path to Buddhahood) was distinguished from all other kings, slaves, or animals among whom he lived. The Bodhisattva is always superior and wiser than any other of his kinds.As to the relief of Avadana, the main figure is not the Buddha himself. All the saintly deeds pictured in this part are attributed to other legendary characters. The stories are compiled in Dvijavadana (Glorious Heavenly Acts) and the Avadana Sataka (The Hundred Avadana). The first 20 frames in the lower series of stories on the first gallery depict the Sudhanakumaravana. The series of reliefs covering the wall of second gallery is dedicated to Sudhana’s tireless wandering during his search for the highest wisdom. The story is continued on the walls and balustrades of the third and fourth galleries. Most of the 460 panels depict the scenes based on the holy Mahayana text Gandavyuha, while the concluding scenes are derived from the text of Badracari. On the last three circular uppermost terraces, 72 stupas circle the huge main stupa on the top of this monument. The circular form represents the eternity without beginning and without end, a superlative, tranquil, and pure state of the formless world. There are no reliefs on the three circular terraces. All but the largest central stupas on the upper levels originally contained a (more or less) life-size statue of the Buddha (kneeling). Many of these statues are missing or damaged. There are also many alcoves along the lower levels which used to contain similar statues. Again, many of these are missing or damaged. For centuries, Borobodur lay hidden under layers of volcanic ash. The facts behind the desertion of this magnificent monument still remain a mystery. Some scholars believe that famine caused by an eruption of nearby Mount Merapi forced the inhabitants of Central Java to leave their lands and monuments behind in search of a new place to live. When people once again inhabited this area, the glory of Borobudur had already been buried by ash from Mount Merapi. It was rediscovered in 1814 by Sir Thomas Stamford Raffles who, during his visit in Semarang, received a report indicating the discovery of a hill full of many carved stones. The hill was believed by the local inhabitants to be the site of an ancient monument called budur. Raffles then commissioned a team led by Cornelius to investigate the hill. It was in 1835 that the site was cleared. Some efforts have been made to restore and preserve the colossal monument since then. Unfortunately, in 1896 the Dutch Colonial Government gave away eight containers of Borobudur stones, 30 stones with relief, 5 Buddha statues, 2 lion statues, several kala stones, stairs and gates of Borobudur, as presents for the King of Siam who was visiting Indonesia. The restoration programme undertaken between 1973 and 1984 during the Suharto era saw considerable of restoration parts of the site. On January 21, 1985 the temple suffered minor damage due to a bomb attack. The creation of facilities for domestic and international tourism around the current ‘park’ has been controversial. Public comment has even been made by the park authority employees as to whether the stonework can handle the numbers of tourists, as their footware is wearing the stone paths. Borobudur has been listed by UNESCO as one of the World Heritage Sites. Interestingly, Buddhist pilgrims from Indonesia and overseas have increased to this location in recent decades, where none had been known earlier. Patronage from Suharto era ministers and generals for the annual ceremonies at Borobudur had probably helped this. Borubudur is very close to Prambanan.